Provide comfort for the family of Donald "Smokey" Martin with a meaningful gesture of sympathy. Donald "Smokey" K. Martin, 88, of Martinsville, passed away peacefully on February 11, 2019. He was born to Howard Otto and Harriet (Anderson) Martin on January 26, 1931 in Brooklyn. He married Doris Jean (Gibbs) Martin in 1973. Smokey is survived by four children, Donald Martin of IL, Marsha Lawless of Noblesville, Daniel Martin of IL and Deborah Martin of IL; five grandchildren; several great-grandchildren; and special companion, Eloise Walls of Martinsville. He is preceded in death by his parents; wife; five brothers, Charles, Claude, Melvin, Jerry and Russell Martin; and one sister, Norma Olmstead. 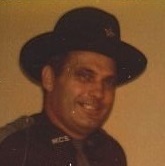 Smokey was a Deputy Sheriff in Morgan County for several years, a truck driver for several companies; a self-employed tree cutter, and worked on a cattle ranch in Texas. He enjoyed playing guitar and dobro. He lived most of his life in Morgan County. Chaplain George Watkins will officiate Smokey's celebration of life graveside service at 11:45 a.m. on Thursday, February 14, 2019 at Mooresville Cemetery. To send flowers in memory of Donald "Smokey" K. Martin, please visit our Heartfelt Sympathies Store. We encourage you to share your most beloved memories of Donald "Smokey" here, so that the family and other loved ones can always see it. You can upload cherished photographs, or share your favorite stories, and can even comment on those shared by others. Provide comfort for the family of Donald "Smokey" K. Martin by sending flowers. I have very fond memories of Smokey and Doris coming to the house and playing the guitar when I was a kid. More recently I gave him the most vague directions ever to our southern Indiana property over 2hrs away to go fishing. . He was supposed to call for actual directions. The next day I see a strange vehicle driving down our road and couldn't believe who was behind the wheel. He just said "I told you I could find you" He was a special man and I always like hearing the stories my dad has with him. He was a gentle giant He will be missed!